Hey Calgary! 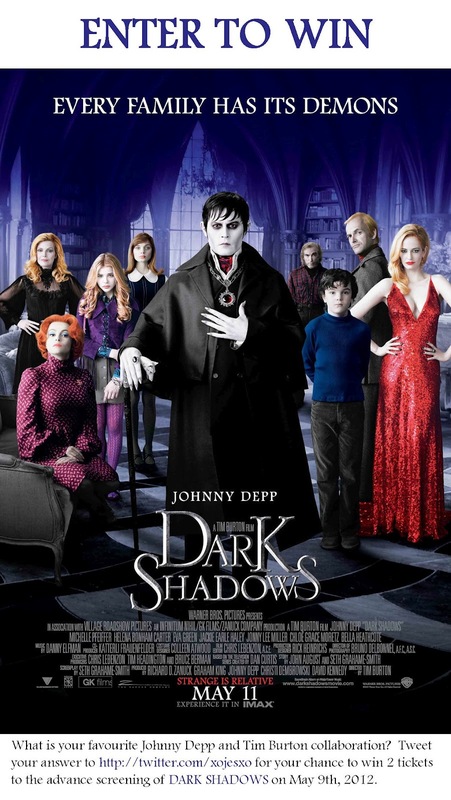 You ready for some Johnny Depp/Tim Burton action? The next Tim Burton film, Dark Shadows, comes out next weekend and I have a chance for 3 lucky people to win 2 tickets to an advanced screening of the flick on Wednesday May 9! To enter tweet me (@XOjesXO) your answer to the following question (or if you don't have Twitter...leave your name and email address in the comments section with your answer to be entered). What is your favorite Tim Burton/Johnny Depp collaboration? Contest closes Sunday at midnight. Winners will be announced Monday. EDWARD SCISSORHANDS! - Stephen D.